THE PICKIEST EATER IN THE WORLD: MERANTI HOTEL'S SPECIAL CHRISTMAS SET MEAL! In case you're not familiar with Meranti Hotel, it is conveniently located at Scout Castor Street in Quezon City, with the Parking located at Roces Avenue. This spot is very accessible to a richly populated residential area of Quezon City, making it an ideal choice to enjoy a nice meal, or even get away from the hustle and bustle of every day life, without having to make a long road trip. 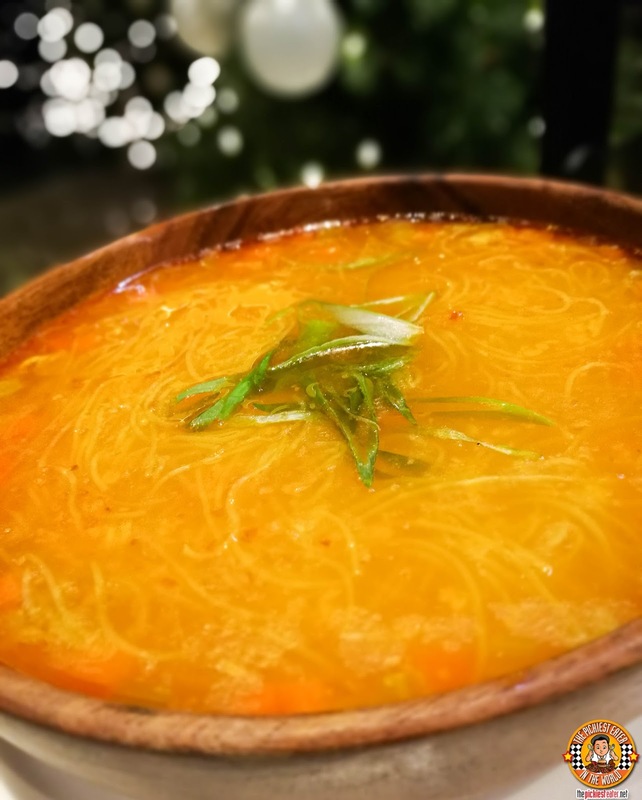 Our Noche Buena Feast began with Meranti's take on the classic Chicken Sotanghon Soup. The broth was packed with flavor, generously filled with thin springy noodles, and shredded chunks of chicken. Every spoonful is guaranteed to take you back to a simpler time. No Filipino celebration is complete without Pinoy Spaghetti, and I promise you, Meranti's version is one of the best you'll ever try! 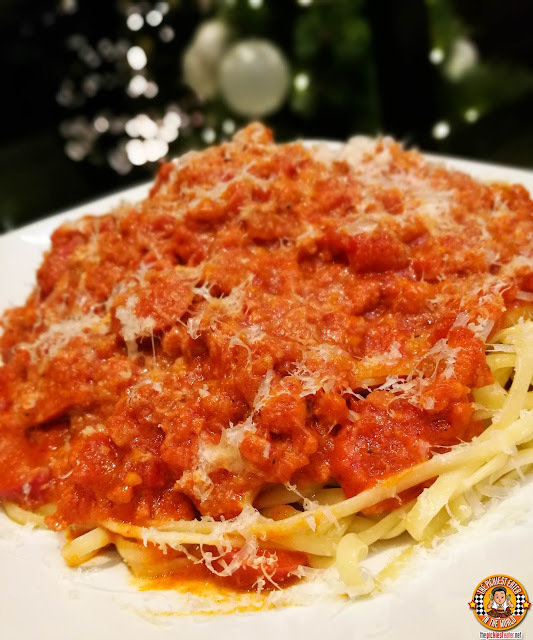 It has just the right sweetness that you look for in Pinoy style spaghetti, but balances itself nicely with the natural acid from the tomato. The Lengua Estofado is quite a hearty dish. 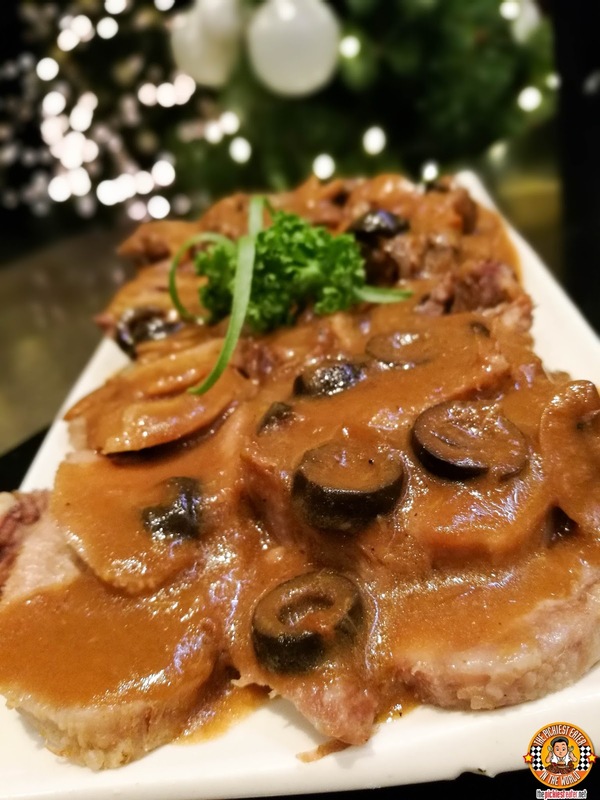 Tender slices of Beef Tongue are doused in a rich, creamy gravy, and peppered with black olives and other spices, giving it a delicious punch of flavor. Adding to the festivities is Seafood Paella, which is cooked in a way where the texture of the tomato sauce mixed rice is rather soft, and topped with choice ingredients from the sea, such as Clams, Shrimps and Mussels. Another highlight was the Chicken Relleno. 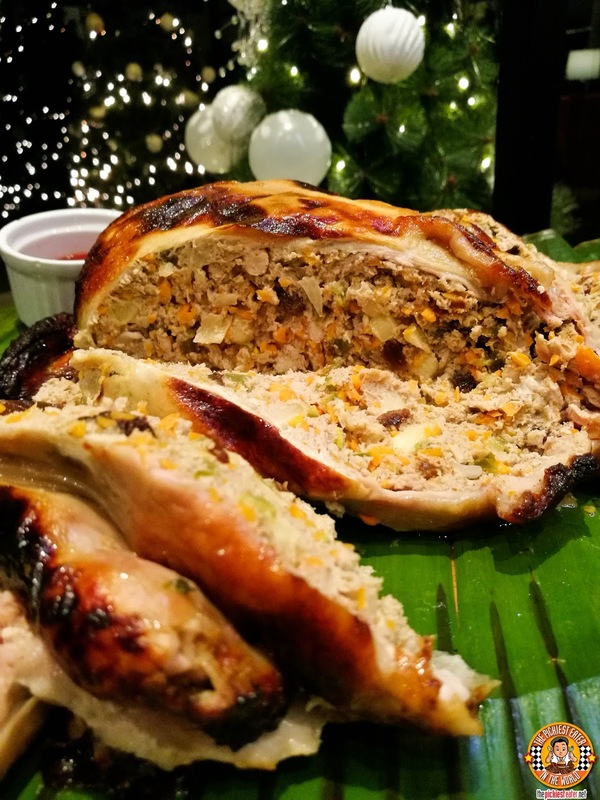 A beautifully Roasted Chicken is stuffed with Ground Pork, Raisins, and another holiday goodness that makes this a great addition to your Christmas feast! For dessert, (I actually had it as an appetizer hehe.. What, like there's a law?) 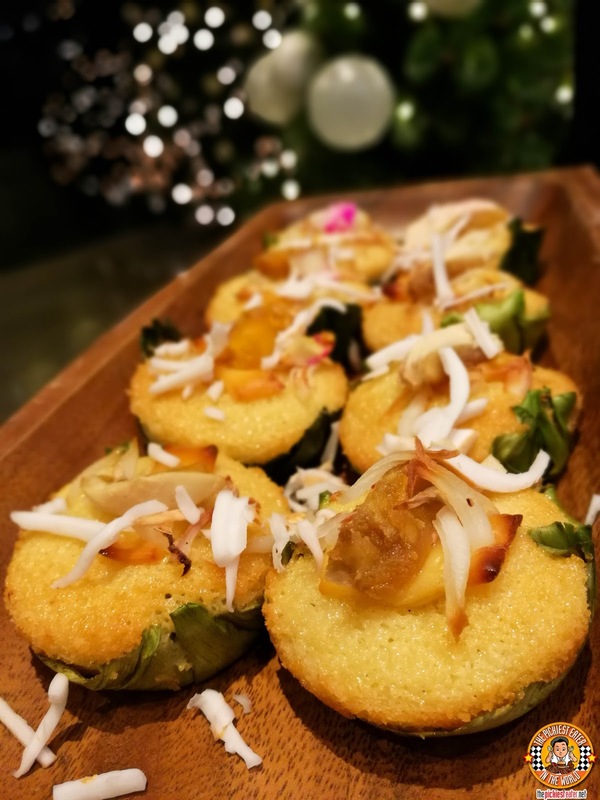 you can have some of Maple's homemade Mini Bibingkas, topped with salted egg. Light and moist, this tasty treat fit right in with the other Filipino delicacies on the menu. For the grand finale was the Agar-Agar, which was really quite a sight to behold. 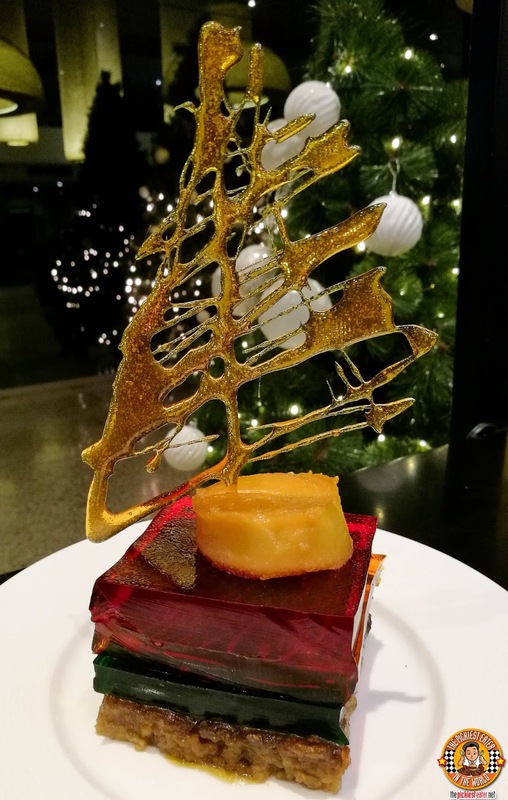 This dessert begins with a delicious Bico base, with three layers of colorful gelatin piled on, then topped with a slice of creamy Leche Flan, with a Christmas Tree shaped Caramel Tuile perched on top. 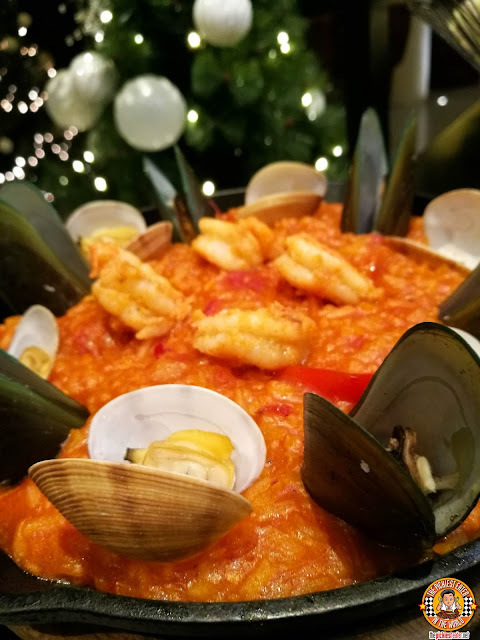 This is a very affordable, yet mouth-watering way to celebrate the Yuletide season, so if you're looking for a hassle-free place to spend Christmas with your family, look no further than Meranti Hotel in Quezon City! Meranti's Christmas Special Set Menu is available from December 24 to 30 and good for 4-5 people, and only costs a very reasonable P2,850++! All these items are not part of their regular menu, so one day reservation is required. Interested parties may contact Meranti Hotel at (02) 376.6340 to 42. Like Meranti Hotel on Facebook!